Luckily, this one is cool! It’s not a shameful, embarrassing sequel that tarnishes and destroys a waning franchise by injecting children, jetpacks and ninja robots. Well, ninja robots and jet packs sound pretty so that lets you know how bad that movie must be. But we ain’t talkin’ bout no Robot cop! We’re talking bout dem Creeps at Night! And how they a ton of fun! Detective Cameron: I got good news and bad news, girls. The good news is your dates are here. That conversation tells you everything you need to know about this film. It’s fun, it’s silly, it’s cheesy, and if that’s your bag, you can do a lot worse. This film has a lot of tonal similarities to Return of the Living Dead (though that film is easily better). 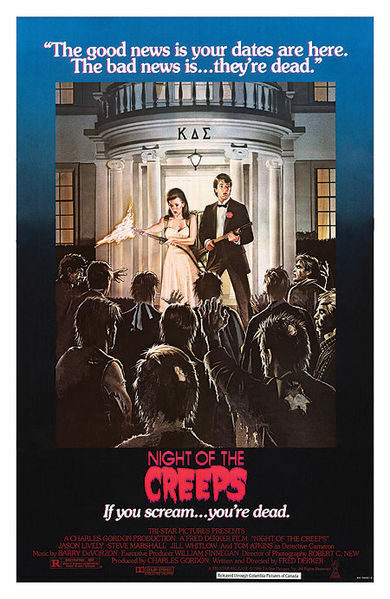 Yet rather than riff on the 80’s punk movement, this one taps into the college move tom foolery genre and the haunted cop genre and throws in brain eating slugs that turn you into a zombie. Oh, and they make your head explode. So… It’s pretty awesome. I like the little touches, like the names of all the characters being after horror directors and a character literally stopping to smell the roses. There’s even a highly dramatized shot of a guy opening his lunch box in a crime scene to eat a sandwich. Deliciously absurd. Tom Atkins steals the show as the aforementioned detective. He’s given most of the one liners and neat scenes and just seems to be having a fun time, which is always important in movies like these. The teen cast was a little less convincing but perfectly fine. I found the main girl, Jill Whitlow to be very cute and reminiscent of Lacey Chabert, whom I’m incredibly attracted to. My favorite sequence is the absurd juxtaposition of a sci-fi movie with strange aliens and a Twilight Zone-esque flashback sequence shot in black and white that’s complete with said space slugs and a bonus axe wielding maniac! That said, it is missing a tiny bit of something to make it in the top tier of this genre. I think it’s simply that it doesn’t go as big as others in its climax. It just sorta ends. Which is fine; it keeps things short and sweet but it’s not the most satisfying of conclusions. This entry was posted in Comedy, Horror, Sci-Fi & Fantasy. Bookmark the permalink.